When you have oily skin, a good clay mask can really make the difference. They clear your skin of excess oils, toxins, plus who doesn’t enjoy a good face mask every now and then? 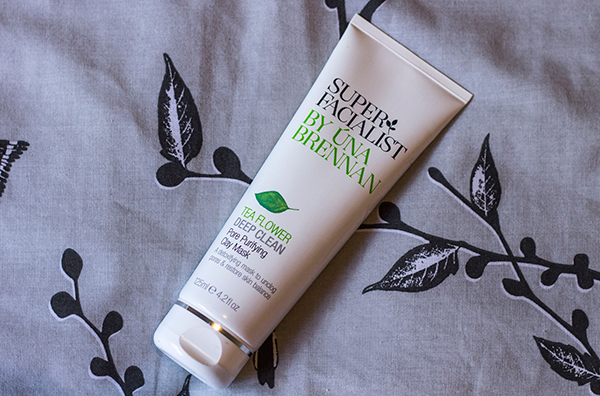 I've recently had the chance to try out the Una Brennan Superfacialist Tea Flower Pore Purifying Clay Mask* to help detoxify my skin and restore it to it’s natural balance. As I've been dealing with oily skin and acne for so long, I know what products which will work for me and what to stay away from. Just from looking at the ingredients I knew I’d really enjoy this mask. It contains Salicylic Acid (known to help spots and unclog congested skin), Dead Sea Mud which my skin absolutely adores, Avocado Oil rich in vitamins A, D and E and Acacia Honey known for it’s antibacterial qualities so I’d say we’re off to a pretty good start already! I always expect clay masks to be very messy to put on but I was pleasantly suprised by how easy this one was. The mask itself is very creamy, almost to the consistency of a heavier, rich moisturiser so there was no problem applying it at all. I found that one half of my skin had already began drying before I could reach the other side so you definitely don’t need to wait about for it to dry. Scent wise, it does have that sort of spa/dead sea smell to it which I really love as I find it quite calming and relaxing but once it’s on you don’t really notice it too much. After 5 minutes (yes, only 5 minutes! ), I removed the mask with a round face sponge and my skin felt so clean and fresh but also quite hydrated at the same time. I would say the removal process is a bit tricky so make sure you have some sort of sponge or face cloth available as water alone probably won’t do the trick so easily. It’s early days but I have noticed a big difference in the redness of my skin and haven’t had any major breakouts since using it so I’d say we’re onto a winner here. All in all I thought this was such a lovely mask and as you can use it twice weekly, lets just say my Wednesday and Sunday nights are now reserved for pampering.